Sara Gilbert, Leah Remini, Julie Chen, Sharon Osbourne, Holly Robinson Peete and Marissa Jaret Winokur on The Talk. Photo by CBS Corporation, 2000. CBS has replaced the long-running soap, As the World Turns, with a women-oriented talk show that premiered last week called The Talk. CBS clearly hopes to have as big a hit as ABC’s The View. Talk has been put together with the express aim of appealing to the large “young mommy” audience: all of its co-hosts, but one, are 40 or younger and the mothers of young kids. By coincidence, all but one of the six hosts have a Jewish connection: being of Jewish or interfaith background and/or married to a Jew. The one co-host who falls out of these categories is African-American actress Holly Robinson Peete. After I realized this connection, I couldn’t help but hope for a dream show. The guest would be Mel Gibson and he would have to sit there, mute, as he was roundly taken to task, and otherwise insulted, by six female hosts who had multiple scores to settle. By settling scores, I am referring to Gibson’s many anti-Semitic and anti-gay remarks of years past. Remarks that were “topped-off” recently when tapes of phone calls Gibson made to Oksana Grigorieva, his ex-mistress and the mother of his youngest child, were released by a gossip website. As you no doubt recall, Gibson used the “N” word and castigated and threatened Oksana in the most sexist, vile language imaginable. Yes, everyone on the panel would like to get a piece of Gibson. But, sadly, I don’t think that dream show is likely to happen. Perhaps SNL could do a sketch based on this premise. Sara Gilbert, Co-Host and Executive Producer answers questions from reporters at the The Talk session TCA — 2010 CBS SUMMER PRESS TOUR held on July 28, 2010 at the Beverly Hilton Hotel in Los Angeles, CA. Photo by CBS Corporation, 2000. The Talk is produced and co-hosted by Jewish actress Sara Gilbert, 35. She became famous playing the younger daughter on the hit TV sit-com Roseanne. In a news conference last August, Gilbert confirmed what “everybody” knew that she’s gay and that her life partner is TV producer Alison Adler (who I believe is Jewish). Adler and Gilbert have two young kids (Adler is the birth mother of their son and Gilbert gave birth to their daughter). Gilbert is the legal half-sister of actress Melissa Gilbert, 46, of Little House on the Prairie fame (and scores of TV movies). Melissa, whose biological parents were not Jewish, was adopted at birth by Barbara Gilbert, who is Jewish, and Barbara’s then husband, actor Paul Gilbert (born Edward McMahon), who isn’t Jewish. Melissa says in her autobiography that she was “lightly raised” in the Jewish faith. Barbara and Paul split-up in 1972 and Barbara went on to wed Jewish attorney Harold Abeles. 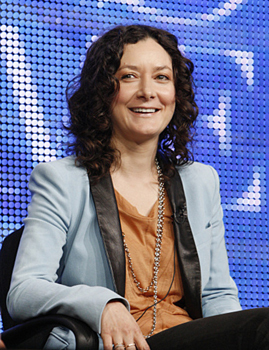 Sara Gilbert, who was born (1975) Sara Abeles, is the biological daughter of Barbara and Harold. When Sara tried to break into acting, her sister Melissa was already an established name. So, for career reasons, Sara’s name was changed from Sara Abeles to Sara Gilbert. Melissa, who played Anne Frank in a TV version of The Diary of Anne Frank, really hasn’t been a practicing Jew as an adult. However, she did opt for a Jewish wedding ceremony when she wed her second and current husband, actor Bruce Boxleitner (who isn’t Jewish), in 1985. Another Talk co-host, Jewish actress Marissa Jaret Winokur, 37, has a more traditional family than Sara Gilbert and Adler—but another “interesting” childbirth story. Winokur, who won a Tony for her performance in Hairspray, is a cervical cancer survivor, so she and her (Jewish) husband, comedy writer Judah Miller, had to use a surrogate mother to carry their biological child. Their son was born in 2008. The other co-hosts are actress Peete; actress Leah Remini of King of Queens fame; TV journalist/reality show host Julie Chen; and Sharon Osbourne, 57, the reality show star and wife of aging rocker Ozzy Osbourne (who isn’t Jewish). Remini, 40, is the daughter of a Jewish mother and an Italian Catholic father. She was raised secular, but has been a devout Scientologist for decades. Remini does have some sentimental ties to her Jewish background. About ten years ago, I read an item in a Los Angeles Jewish paper about Israeli Jewish survivors of suicide bombings touring Los Angeles. They chanced to visit the studio where King of Queens was filming. The piece described how Remini went out of her way to greet these survivors, answer their questions, and show them around. Sharon Osbourne’s late mother wasn’t Jewish. Her late father was Jewish, and after many years of bad blood, they reconciled not long before his death. (To be frank, her father, a music industry executive, was a total jerk). Les Moonves at the 2009 Tribeca Film Festival premiere of Woody Allen’s film Whatever Works. Photo by David Shankbone, 2009. The very pretty Chen, 40, is married to Les Moonves, 60, the head of CBS. Chen’s father was an important figure in the pre-Communist government of China. He fled to the United States with the Communist take-over in 1949. Her mother comes from an ethnic Chinese family that once lived in Burma. I don’t know if her parents followed any religion, like Buddhism. Moonves, who is Jewish, began an affair with Chen while still married to his first (Jewish) wife, who is the mother of his three older children. As you can imagine, the affair caused quite a scandal and the divorce was very messy. Moonves and Chen wed in 2004 in a private ceremony in Mexico and no details were released about whether any clergyperson presided over the nuptials. They now have one child, a boy they named Charlie, who was born last year. 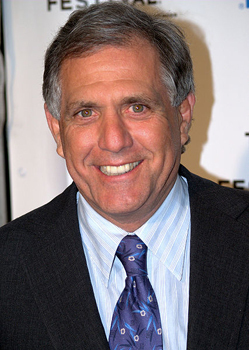 Moonves, by the way, is the great nephew of David Ben-Gurion, the famous first Prime Minister of Israel. Moonves’ paternal grandmother’s sister was Ben-Gurion’s wife. Jewish actor David Schwimmer, 43, best known for playing Ross Geller on the mega-hit Friends, has married for the first time. Two weeks ago, his press rep announced that Schwimmer and Zoe Buckman, 25, his girlfriend of 3 years, wed in a “private ceremony” last June. No photos of the ceremony or further details were immediately forthcoming. If you relied solely on the coverage, to date, in the general (and Jewish) media, this is what you’d find out about Buckman: She’s English and quite pretty; she and Schwimmer met in 2007 when he patronized a hip and exclusive London club where she was working as a waitress; and now she’s a part-time photographer. However, this “intrepid reporter” dug through obscure web sources to find out a lot more. As the pieces fell into place, it became apparent that the newlyweds have a lot in common. David Schwimmer and Zoe Buckman at the Los Angeles premiere of Run, Fat Boy, Run. Photo by Jeff Vespa, WireImage.com, 2008. Schwimmer comes from a moderately religious, high-achieving home (his Jewish parents are both Beverly Hills lawyers). Theater has been Schwimmer’s passion since he was a child. While still in college, he was a co-founder of Chicago’s Lookingglass Theatre Company. He has regularly appeared on the stage in Chicago, Los Angeles, New York, and London. Buckman comes from a very interesting interfaith family. Buckman’s mother, Jennie Buckman, is Jewish and Zoe described herself as Jewish in a recent civil rights petition that she, her mother, and her mother’s brother, Peter Buckman, signed. Peter Buckman is an important literary agent who also writes (TV’s Inspector Morse). Zoe’s father, Nick Blatchley, a government health expert, is not Jewish. Blatchley’s father was Catholic. Blatchley’s late mother, born Chattie Salaman (yes, that really was her name), was the daughter of a very wealthy English Jewish father and an upper-class Anglican English mother. The religious odyssey of Salaman, and her only sibling, author and actress Merula Salaman, can be found in the authorized biography of Sir Alec Guiness, the late famous English actor (Bridge on the River Kwai, Obi-Wan-Kenobi in Star Wars). The Salaman sisters were raised secular, but Chattie found herself drawn to Anglicism during WWII and became an Anglican. In this path, she was encouraged by Guinness, who had become a devout Anglican Christian not long before the war began. Guinness, himself, eventually came to be drawn to the Catholicism and he became a Catholic in the late ‘40s. His wife, Merula (later Lady Guinness), followed him into the Catholic Church.